"The El Dorado marked a distinct stylistic shift in Roth's work toward a less plastic modeling of the mass and toward a Modernist sense of detail as applied to an essentially Classical composition," note authors Robert A. M. Stern, Gregory Gilmartin and Thomas Mellins in their monumental book, "New York 1930 Architecture and Urbanism Between The Two World Wars," Rizzoli, 1987. "Because of its Modernist articulation, which could be most clearly seen in the futuristic belfry-like finials concluding each of its two towers, the Eldorado [sic], even more than the San Remo, offered convincing evidence that Classical compositional principles could rise to the demands of a new building type and a new expressive sensibility," they continued. "The futuristic sculptural detailing of the El Dorado, as well as its geometric ornament and patterns and its contrasting materials and textures, make it one of the finest Art Deco structures in the city. The towers are terminated by ornamented setbacks with abstract geometric spires that have been compared to Flash Gordon finials," observed Steven Ruttenbaum in his definitive study of Emery Roth: "Mansions in the Clouds, the Skyscraper Palazzi of Emery Roth," Balsam Press Inc., 1986. Ruttenbaum's book illustrates an earlier design by Roth for the El Dorado that is neo-Classical and has a mini-tower tucked between the two large towers. That abandoned design was quite graceful and unfortunately was not used elsewhere. With 1,300 rooms, the El Dorado is roughly the same size as the other twin-towered buildings, but its 186 apartments are generally smaller than those in the others. Its base employs cast stone rather than limestone, reflecting the fact that this project was intended for a slightly less affluent clientele than its twin-towered neighbors to the south. The El Dorado's base is nicely modulated vertically by four sets of darker mullions while the two towers are modulated by three sets of darker mullions. The overall effect is quite rhythmic. Despite the presence of a few rounded balconies and nice geometric patterning and detailing at the base of major setbacks, the building has great élan and the rather awkward finials have a machine-like intricacy appropriate to an age that was experimenting with streamlined machinery on the eve of the age of rockets. In 1995, the building added a duplex gym in its basement and sub-basement with an elevator for the handicapped, a community room and a basketball mini-court. The building replaced a hotel, designed by Neville & Bagge, of the same name on the site that was built in 1902 and had a garage with a "charging room for electric automobiles," noted Christopher Gray in a September 14, 1997 article in The New York Times. 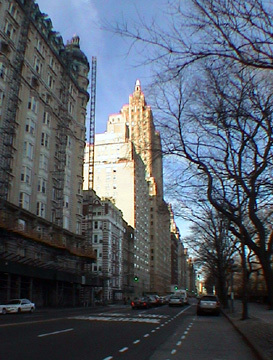 A December 31, 2001 article by Gray in The Times, however, noted that the original building on the site was known as the El Dorado and was a 8-story apartment house that was acquired in 1929 by Louis Klosk, "a Bronx-based developer" whose architects, Margon & Holder, filed plans for a 16-story building but subsequently revised it to a 29-story structure with twin towers as "Multiple-Dwelling Law of 1929 allowed such towers where lot sizes were large." According to Mr. Gray, "on his own, Roth developed a nearly Romanesque design with red tiles on the roof areas, similar to his Oliver Cromwell apartment house at 12 West 72nd Street." Mr. Gray also wrote that the Margon & Holder filed plans for the tower indicated gold leaf for the finials. 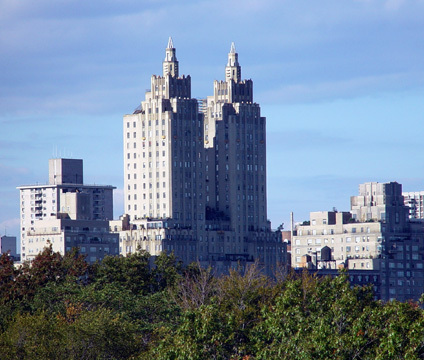 The building went into foreclosure in 1931 and was reorganized by the Central Park Plaza Corporation. Mr. Gray wrote that "among its earliest tenants were Rex Cole, who made millions marketing General electric refrigerators, sold from his trademark stores built to resemble giant refrigerators." Another early tenant, he continued, was "Royal Copeland, "who served as mayor of Ann Arbor, Mich., from 1901-1902, then senator from New York from 1924-1938. A third early tenant was Dr. Stephen S. Wise, the prominent Reform rabbi and leader of the Free Synagogue, later the Stephen Wise Free Synagogue, who was a leading Zionist and a founder of the American Jewish Congress. Another was Barney Pressman, who founded the Barneys clothing store in 1923. In more recent years, the Eldorado has become associated with entertainment figures, like Faye Dunaway, Garrison Keilor, Tuesday Weld and Michael J. Fox, who have had apartments there." In his excellent book, "New York Streetscapes, Tales of Manhattan's Significant Buildings and Landmarks," (Harry N. Abrams Inc., 2003), Mr. Gray has a chapter on the El Dorado in which he observed that "the earliest published version showed fairly simple streamlining on the base and towers but squared-off tops." The building was converted to a cooperative in 1982 and became an official city individual landmark in 1985. In 2000, the building launched a $4 million façade restoration program. "Moby, the Lower East Side's favorite vegan raver/tea mogul/real estate investor, had a whale of a time unloading his amazing but inconvenient pre-war penthouse in Central Park West's twin-towered El Dorado building. 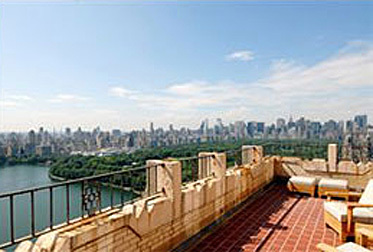 Listed for $7.5 million back in 2007, the four-floor, multi-terraced "castle in the sky" (with a turret all to itself!) on the 31st floor of the south tower can only be accessed by taking an elevator up to the 29th floor and walking up two flights of stairs. Plus, there's the spiral staircase within the apartment itself. Whew, what a workout! Interest was somewhat soft, so Moby started shilling for the place hard, recording video walk-throughs and offering his friends a $75,000 referral fee if they found a buyer. Eventually the place sold for $6.7 million after a previous party was denied by the El Dorano's co-op board. Fast forward two years, and the penthouse's post-Moby owner, listed on the old deed as T.M. Dempsey, has grown tired of the place. Or maybe it's his calf muscles that are calling it quits. And he's taking a big loss on the place, it seems. A Curbed tipster notices that the formerly Mobylicious penthouse was quietly listed for sale in January for just $5.995 million. That asking price has since come down to $4.995 million (Moby paid $4.5 million for the penthouse in 2005), and the 2BR/2.5BA spread with incredible views is now in contract. According to the listing, the turret room is currently set up as a media room, but can be turned into another bedroom. And to prove that the stairs situation is not all that bad, broker Ann Lenane includes a video clip (is it just our screen, or is the video picture cut in half?) of her scaling El Dorado Mountain. Feel the burn!"